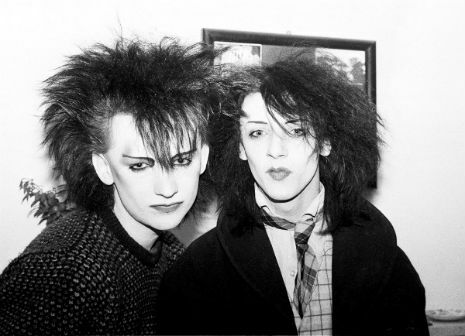 A quick peek at the goth-rock scene in London that stared it all, edgy and defiant and blase like the imps of Western Europe staring-down the Berlin Wall. Call them “The New Romantics”. Lydia can relate. Left-ward, politically and highly artistic and sensitive– and into causes such as animal rights or Amnesty International or anti-nuclear power movements, they’ll shoot you a whiplash smile like a tribe of depressive brats in wicked eyeliner invading Cathedrals like imps, androids, waifs, poets, and black angels. Surely, death-obsessed like decadent odes to rainy skies and urban decay– and portals into netherworlds of club-culture and “beat, happening” in mannered languor as strange & unusual as kids are impressionable and drawn to darkness. Death on a practical level is like a vulgar t.v. repair-man of practical, unclean mind as death is far more romantic than bringing home a paycheck– where selling your soul is not more big a thing than getting your truck refinanced at Lou Fuze auto-dealer with the colored flags and giant inflatable “King Kong” bouncing like a black-cat firecracker along the main drag on Lindbergh. Lydia lives in the city of tumbled-down feld-spar as St. Louis is made out of “moods and territories” that overlap and shade into each other as worlds will collide and we will have a very clever movie. I couldn’t turn to another town for better inspiration. Beetlejuice 2: Hawaiian St. Margarita Coaster as you have a fiend in a lawn-chair, his feet in the kiddie pool, and knocking back a case of Busch beer. Hang on with us, and more cinematic truths will unfold for the reader’s eye. . . . .
“Life is like an empty beer-bottle. . . . . . you always know what you’re gonna get”.